Growing up, my mother made a loaf of homemade bread in our bread maker every Sunday during the cold winter months. Sunday's lunch was often the most looked forward to meal of the week, as it was always prepared from scratch and with lots of love. Homemade soups and stews were the feature, but a loaf of homemade bread was never amiss. My family devoured the loaf of bread in one sitting, arguing over the final pieces. Everyone, of course, but me. I was a picky eater. I was an indignant eater. I didn't like sandwiches. I didn't like bread. And I certainly didn't like crust. Occasionally I'd manage to eat half a piece of my mother's homespun bread, but I always opted for the saltines if they made an appearance. As it so happens, over the years my tastes evolved and I found myself wanting to eat more bread and less saltines. However, because I was an indignant eater (and terribly stubborn to boot), I couldn't let my mother know I actually liked her bread. So, I begrudgingly ate my saltines and lifted my nose at the sight of the beautiful, crusty bread. I did this for years. Stubbornness was (and still is) one of my many flaws. It wasn't until I moved out on my own that I began to eat bread with great fervor, savoring each piece as I wish I had in the previous years. When I moved to Montreal, my love for bread flourished. With a dozen bakeries in walking distance wafting the smell of yeast and crusty bread into the streets, a baguette or two found its way to my kitchen more than my waistline would have liked. Baking my own bread has really allowed me to appreciate each loaf for its own unique taste and texture. This Rosemary Focaccia was my first foray into the realm of focaccia and, long after this bread has disappeared, I still find myself wishing for just another piece. 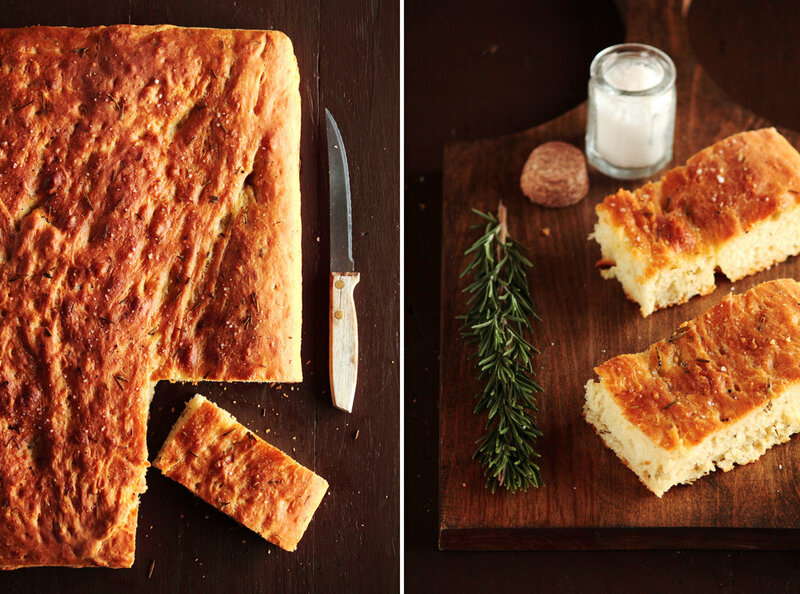 This Rosemary Focaccia is salty and chewy, with an unbelievable crust. The bread is made with fresh rosemary, coarse sea salt, cracked pepper, and olive oil. 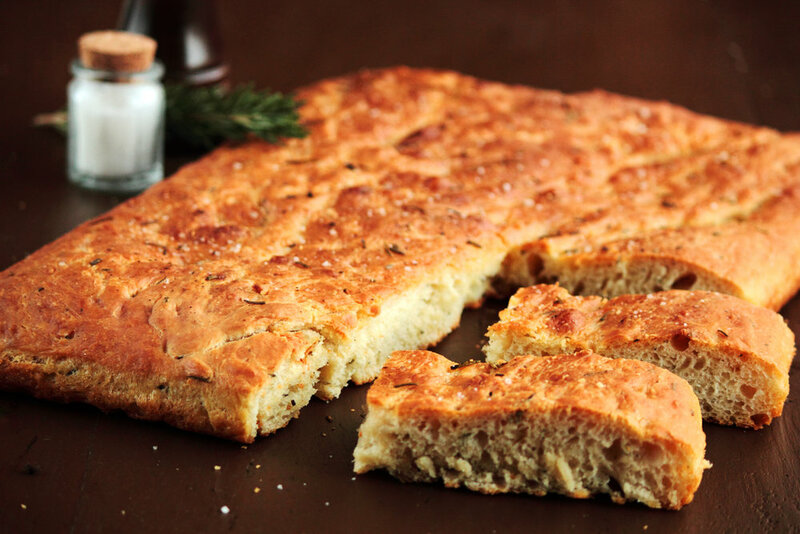 The bread's thick crust develops from baking in the oil, giving it an almost fried quality. It is perfect served plain, with no additions or spreads. This bread shines on its own. I've made this bread twice in the last couple weeks and, though it is fairly involved, I have a feeling it will make an appearance again very soon. In a large mixing bowl, mix together bread flour, water, and active dry yeast. Cover the bowl with plastic wrap and allow to rise in a warm, dry place for 1 1/2 to 2 hours, or until dough has tripled in volume and is bubbly. If using a stand mixer, attach dough hook and mix in salt and rosemary. Knead dough for an additional 5-7 minutes. Dough will be loose and sticky. If you do not have a stand mixer, turn dough out on a heavily floured surface and, using your hands or even a wooden spoon, attempt to knead the dough. Mix in salt and rosemary at this time. Add flour as needed and fold dough in half in all directions if it will not cooperate enough to knead. Dough will be very difficult to handle, but try to incorporate as little flour as possible (it results in a softer bread). Cover with plastic wrap and allow to rise for another hour, or until doubled in volume. In a 13 by 17-inch rimmed baking pan, evenly distribute 2 tablespoons of olive oil to coat pan. Turn out down onto pan and, with oiled hands, pull dough to the edges of the pan. The dough may resist at first, but with a little patience it will stay put. Cover dough with a clean dish towel and allow to rise for an additional 15-20 minutes. Using your fingertips, poke a couple dozen holes into the top of the bread. Pour remaining olive oil evenly over bread and sprinkle with a light dusting of coarse sea salt, rosemary, and freshly cracked pepper. Bake for 30-40 minutes, or until golden brown. Let cool slightly in pan before serving warm or at room temperature. On the second day, the crust may soften. To bring back the crispiness, I suggest reheating the bread in the oven at 400 degrees F (205 degrees C) for 5-8 minutes.